The weekend saw some of the NetSurf developers gather once again to do battle against the Red Queen...no, wait. I mean plan and write code. 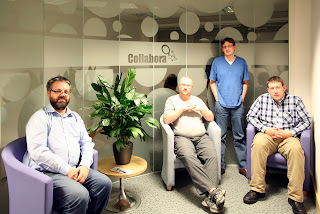 The successful event was once again kindly hosted by Collabora at their Cambridge office, the facilities remain as good as at the previous event and provided a comfortable environment in which to work. Four developers managed to attend from around the UK John-Mark Bell, Vincent Sanders, Daniel Silverstone and Rob Kendrick. The turnout was a little lower than previous events, however Michael Drake managed to assist with some bug fixes remotely. From Friday to Sunday afternoon we each managed to put in 24 hours of work consisting of almost 90 commits changing over 100 files and removing 10,000 lines of code. The main theme of the event was consolidation ready for the 3.0 release. While not a glamorous target this is a major release for the project which we want to achieve soon, this requires the completion of numerous ongoing tasks (like finally removing the dependency of libxml) and fixing as many reported bugs as possible. Removal of libXML from "full save" and "libSVGtiny"
Significantly improve the performance of DOM event dispatch. Once the final usage of libXML is removed (from the hotlist code) NetSurf will become substantially smaller on several platforms as we will not have two separate parser implementations linked. We had a Raspberry Pi which was used to run RISC OS so we could examine the operation on this system. The 2.9 edition as shipped works OK but is lacking the substantial progress made in the last six months. The CI system build was run on the system and works well so we are reassured the 3.0 edition will provide an even better browsing experience. The event was a great success overall and we are now very close to our 3.0 release which we hope to produce before Christmas.